Home > Blog > Childhood > Why can’t children just go to the park? “Why can’t children just go to the park instead of playing in the street?” is a question that pops up everywhere from street meetings, to online comment threads and council meetings. We thought it would be a good idea to give a response from a parent and a research point of view. Parks are great. But the reality is that most parents nowadays simply don’t feel happy to let younger children go to the park on their own and sadly, even if they did, they would probably be judged for doing so. This means that “just going to play in the park” generally involves parents having the time, energy and means to get their children there and stay around to watch them play. After school, there are often pressures on time – you need to get home to cook tea, do homework, change nappies etc. and getting kids to the park for a run around can feel like one thing too many. Especially in the darker months, standing around in the cold while your children play can also be quite an unappealing prospect! This is not a matter of parents being “lazy”. Not until this generation has it been deemed normal or expected for parents to devote large amounts of time to supervising children while they play – and our lives are busier than ever. By contrast, if your children had the freedom to play out safely on their own street or estate, they could come home from school, drop their bags, go to the loo, have a snack, and go out to play whilst you get on with things. You can keep half an eye on them and they can just come home if they need to. They are able to play with others on the street, make up their own games, develop their independence and resilience. Playing out on bikes, scooters or roller-skates is much easier on the street than having to lug these things to the park. Street play also builds a sense of community for everyone. This is the culture we are trying to rebuild through the ‘playing out’ model of temporary road closures. 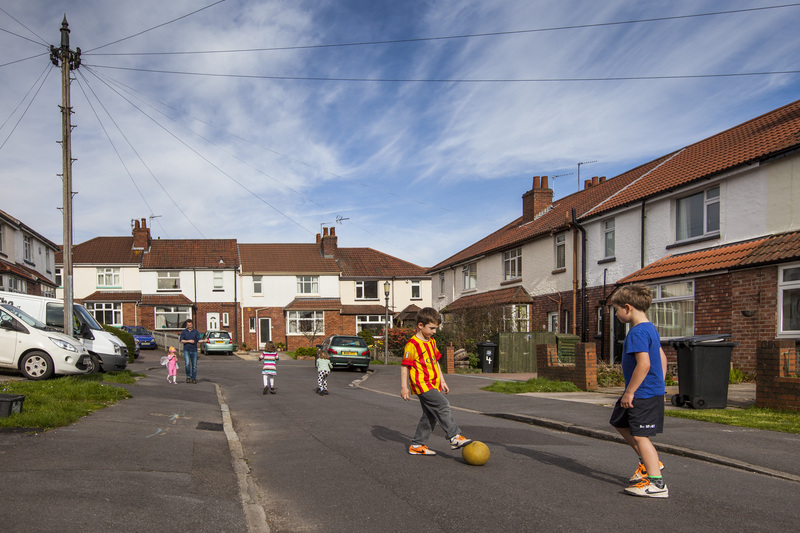 Our long-term vision is that all children have the freedom to play out on their own street and, as they gain more independence, can safely get to the park and other places under their own steam. Rob Wheway of Children’s Play Advisory Service, explains why playing out needs to be close to home. “Children’s daily play places have always been within sight and sound of their own homes. Previous generations might have had the freedom to travel further, but their daily play place was still predominantly close to where they lived. There are good reasons for this. Firstly: basic security. Children feel safe if they can run home quickly when they feel threatened, or if they’ve hurt themselves to get it ‘kissed better’. They can also run home to plead for money if the ice cream van comes by! Playing just outside home is also simply more convenient and arrangements more flexible. A trip to a local park or other attraction can be an adventure and very worthwhile but it takes some organisation. A child is unlikely to wander to the park on their own because they will feel vulnerable and the whole journey may be a waste of time if none of their friends happens to be there. “I have carried out observational and interview research for a variety of local authorities and housing trusts. What has emerged – from both parents and children – is that up to the age of 10, children are not expected to go further than the end of the road without an adult, or possibly just round the corner. At about 10 years old, children are permitted to go much further. It appears that parents allow this because they realise that soon the children will have to travel to secondary school unaccompanied, and so need to prepare them for this. It may also be that children are old enough to start pushing against the restrictions. And these restrictions are much more severe than in previous generations. This means that at the age of 4 they would have been allowed to play at least on the front doorstep and probably in front of a few houses up and down the street. They would not have gone from not being allowed out of the house to walking to school unaccompanied without some transition between these two states. And later they were often allowed to play in the next street, if it was near a friend’s house where the friend’s mother or father could keep an eye on them. So even though children went further afield than they do nowadays (and this is well documented in this famous Roaming Range article) their everyday play was still in the street, in sight and sound of their own home or a friend’s home. “One thing that has significantly changed from previous generations is the amount of motorised traffic, even on residential side streets. Previous generations could play happily in the street and only have to move aside for an occasional car or, previous to that, the occasional horse and cart! Now, traffic is everywhere, and going faster. Sadly those responsible for advising Governments have simply not noticed or even worse knowingly ignored the fact that there has been this dramatic increase in motor traffic. And yet it has had disastrous consequences for our children. They are no longer getting out for their everyday play and exercise which is resulting in increasing obesity and more mental stresses. There is also even an increase in rickets from lack of daylight and vitamin D.
“The government’s emphasis on exercise at school is flawed. If you count holidays and weekends you find that children only go to school about half the days in the year. The other days are completely free for play and even on school days children have time to play out after school. Building new playgrounds is not the answer either. Because children do not travel very far to parks for their regular play place, the only way we could build enough playgrounds would be to knock down houses every 50 or 100 yards. I don’t believe any Government is going to do that! Nor should we blame parents. Traffic has become so dangerous that they sensibly keep their children indoors. They should not be unfairly blamed for bringing up ‘cotton wool’ kids. They are merely responding to the real increased danger. “Residential side streets need to be the equivalent of a pedestrian crossing all the way along the road. That way, it would be the duty of the car to make way for the pedestrian – or child playing, cycling, scooting – and not the other way round. This would benefit both children and adults. 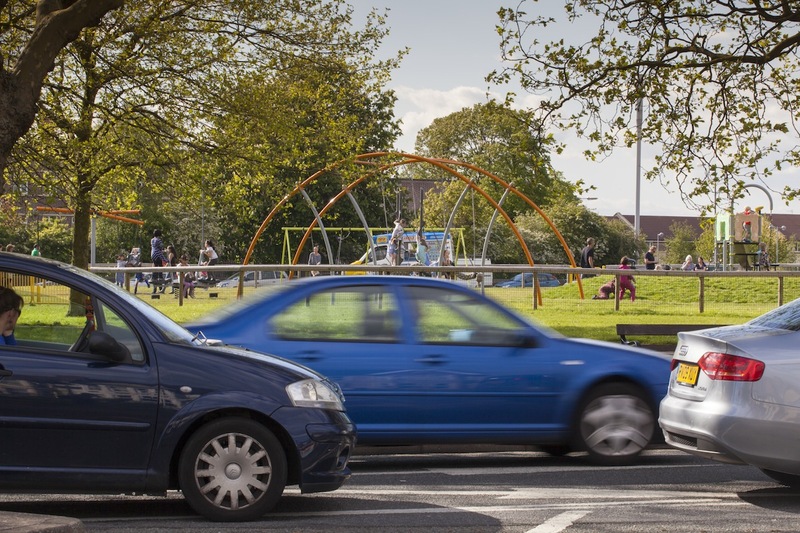 In my research and my experience of assessing hundreds of playgrounds each year for over 25 years, I have found that where traffic speeds are restricted, such as cul-de-sacs and where there are sharp “halt” junctions, children still play out as they always have done. The children get daily healthy play and exercise. Parents benefit from more neighbourliness, and they ‘keep an eye out’ for each other’s children. Adults talk to each other more. All this at virtually no cost to government, as long as they don’t insist on the costly Home Zones. Priority to pedestrians on residential side streets would mean a much healthier lifestyle for our children and an increase in neighbourliness for all. Until that time comes, Playing Out is a great way to gain this space and safety in a temporary way”.